To provide a high-quality online record keeping system for tracking CTE program involvement among students and educators. We provide educators with valuable reports for assessing student learning throughout the year, promoting their program(s) and garnering community support for CTE. For students, we offer helpful tools such as a professional portfolio, resume builder, and standards-based journaling to make documenting their successes and planning their future easier. 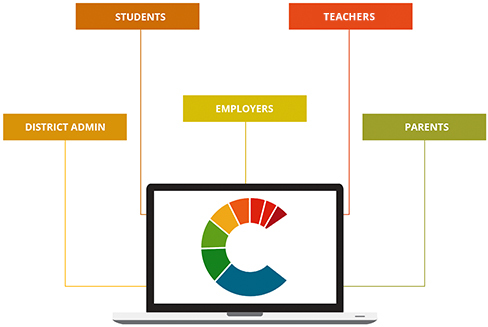 With its intuitive design, CTE Manager makes it easy for you to track program strength and involvement in CTE. Students record time and financial resources allocated to their project(s), and supervisors assess progress throughout the year. Students record time and financial resources allocated to their project(s), and supervisors assess progress based on industry-recognized standards throughout the year. By keeping up-to-date records, students can generate reports such as a one-click resume. Combined student project data makes for great economic impact reports to share with community stakeholders. With a single glance, know where students spend their time in a workplace setting. Employers with strong school partnerships help ensure industry relevancy in classroom curriculum. Projects and evaluation tools in CTE Manager are aligned to National Common Core Standards and U.S. Department of Labor descriptors to ensure relevancy in-and-outside the classroom.